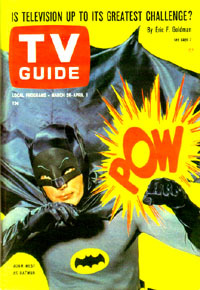 50 Years Ago Today... Batman On TV! TODAY'S FEATURE IS BLOG #4062 - I wanted to mention that today is the 50th Anniversary of the Batman TV Show back in 1966! Yes... Today! It doesn't seem that long ago to me, but then again, I was just a teenager, (aged 13), when it first appeared. I of course watched it on TV, for all three seasons, seeing almost every episode, almost all 120 of them, for the three seasons that it ran on ABC TV. 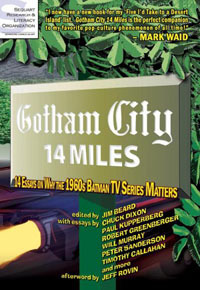 A few years back I was asked by Jim Beard to be one of the contributors for his then projected book titled: 'Gotham City 14 Miles'. 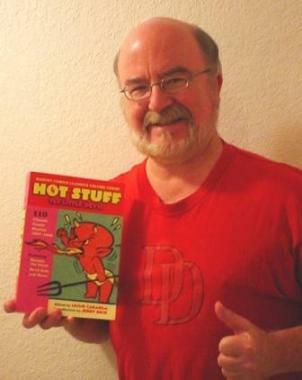 I gladly accepted the challenge and wrote my chapter for the book. It was fun doing so, and I thank Jim Beard for the assignment! To think that today, a few years later after that book was published, comes the 50th Anniversary of that magical date when the Batman TV Show burst on the screen with its Pow! Zap! Bam!... WoW what excitement that was! Congrats to the Batman TV Show on celebrating its 50th Anniversary! TODAY'S FEATURE IS BLOG #4060 - I wanted to wish all of the readers of this blog a Happy New Year for 2016! Seeing in the New Year comes with viewing the KTLA Channel 5 showing of the Rose Parade. This year marked the 127th Parade! It also marked the last year of my favorite team of announcers for this or any parade, that of Bob Eubanks and Stephanie Edwards. 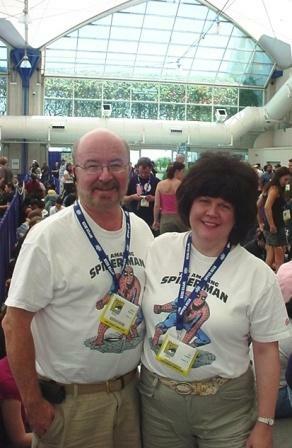 They have spent most of the past 35 years together doing this annual parade. 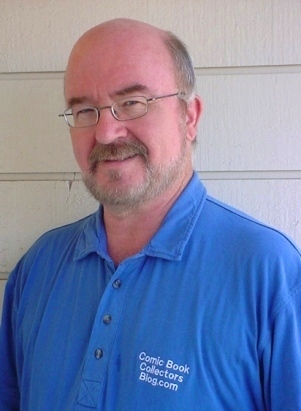 Bob had started 3 years earlier, with two other co-hosts. Stephanie had stepped out in 2006, but came back in 2009. For more on this history, please see Bob's Wikipedia entry. I know that 2017's Rose Parade won't be the same without them... You see, I started watching them when I lived in the Los Angeles / Orange Counties areas when they started. I hope that 2016 brings nothing but good for all of you also. 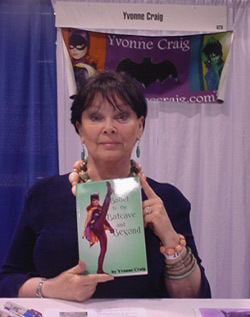 TODAY'S FEATURE IS BLOG #4048 - I just read of the passing of Yvonne Craig, who died August 17th of 2015. 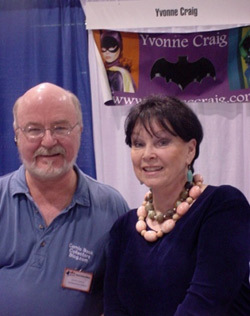 I had the fortune of meeting Yvonne a few times at conventions, including the San Diego Comic Con in 1996 with Julie Newmar, (blog #3173), and at the Wizard World Anaheim 2010, (blog #3112). 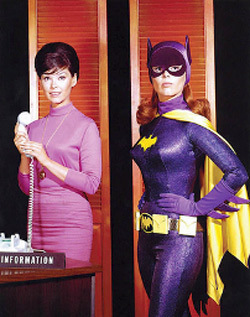 Before Yvonne was 'Batgirl', I had seen her in several Elvis Presley films, and always enjoyed her roles in the films. She also was 'Marta', the green skinned Orion girl in the Original Star Trek episode 'Whom Gods Destroy'. Yvonne was definitely a fine actress during her screen career. For more info, please see her Wikipedia entry. I feel sad about her passing at the age of 78. I am glad I got to meet her during the years. My Take On... The Zone Show Episode Featuring Jack Kirby! The Zone Show Episode Featuring Jack Kirby! As Previewed At the 2015 Comic-Con International! TODAY'S FEATURE IS BLOG #4039 - I'm still continuing blogging about items, people, panels, etc. that I saw at the 2015 San Diego Comic Con International. 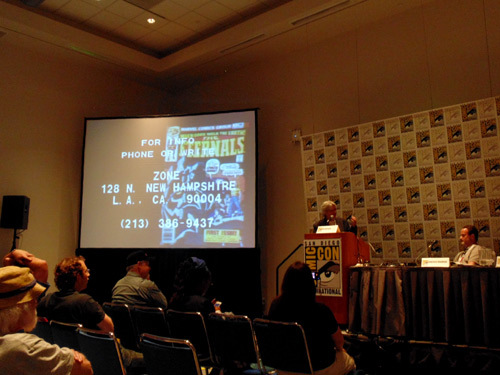 On Thursday, July 9th at 4:30 PM, in Room 26AB, there was a program / panel on 'The Zone Show: The Jack Kirby Interview. You see, In the early 1980s Ray Zone operated a cable access show in Santa Monica, CA. It was in October of 1984 that he interviewed Jack Kirby on his show. To the panelists' knowledge it was broadcast just once in November 1984 to the local Los Angeles audience. To my knowledge it was just broadcast that one time. Until the 2015 Comic-Con International panel / program. The episode itself was found in a garage containing Ray's effects after he passed. 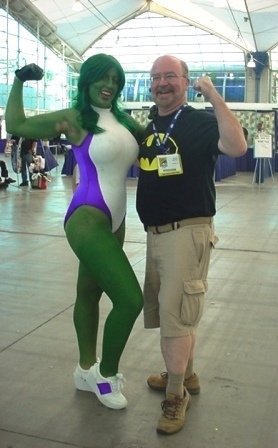 I understand that it was transformed to digital media before the showing at Comic-Con. So this episode was not seen for over 30 years! The Zone Show was a cable access show, so the production effects were just a little on the inexpensive side. 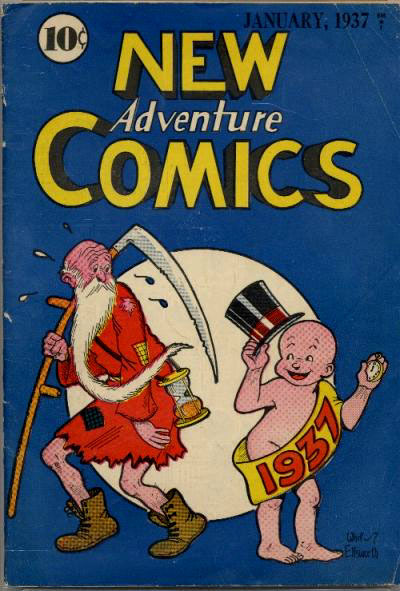 The shots of Ray & Jack talking had bizarre artwork around them, and then comic book covers superimposed that had nothing to do with the current topic being discussed. Although they were Jack's artwork on the covers. Yet despite the somewhat laffable effects, the stories that Jack told and that Ray listened to were mighty fine to look back on now. 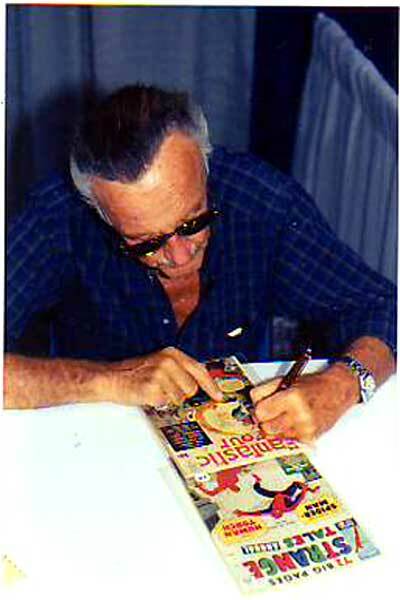 With Jack being gone 21 years ago, this was a pretty good video record of Jack's thoughts on comics and the comics business up to the 1980s. If you get a chance to view this video or take in the panel at a comic convention near you, you should do it! Here's the link to the video that I shot of the panel. Note: It is just the first eleven minutes of the panel, not the video itself. Panelists included: Eric Kurland, (3-D Space), Randolph Hoppe (The Jack Kirby Museum), Lawrence Kaufman (National Stereoscopic Association), and John Morrow (TwoMorrows Publishing) . My thanks to those involved that shared this video at Comic-Con! The I Love Lucy Superstar Special! TODAY'S FEATURE IS BLOG #4028 - Yesterday late in the afternoon, I posted a link on my Facebook Fan Page, (Michael D Hamersky On Comics), that on Sunday evening, a special would be on TV on the CBS network. That special was titled: The I Love Lucy Superstar Special. Well, from the lettering you could tell it would be big. And it was! The superstar of the second half of the Special was none other than Superman, as portrayed by George Reeves back in 1957 when the episode of I Love Lucy was first presented. That was the reason I posted about the Special being aired on my Facebook Fan Page. 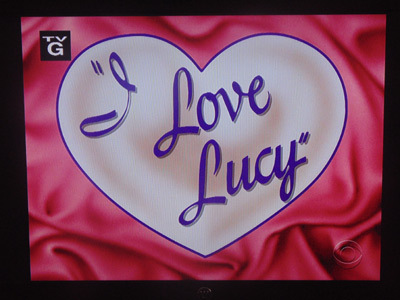 Plus this was the first ever showing of the 'colorized' format of the I Love Lucy episode, which was a real treat! Yes, the episode was somewhat 'chopped up', but the storyline was great and the colorization was pretty darn good! The story started with little Ricky Ricardo watching an episode of 'The Adventures of Superman' with his dad, Ricky. Then Lucy comes into the living room, shutting off the TV, saying that it was time for little Ricky to go to bed. Little Ricky had been wearing his Superman costume while watching the TV show. ... Both mothers keep Saturday as their son's party date, and the race is on as to which kids will show up at the other birthday boy's party. Lucy finds out that the friend has a clown, puppets, etc., and only when she hears her husband Ricky mention that Superman was at his studio that she asks him to have Superman come to Little Ricky's party. Not waiting for confirmation, she immediately calls up the friend's mother and tells her that Superman is attending Little Ricky's party. Well, that put an end to the friend's party! 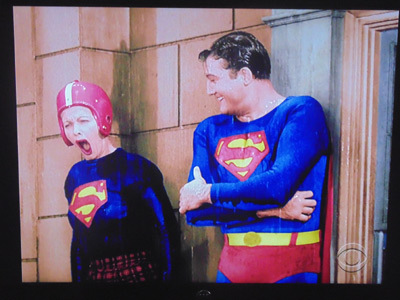 Then Lucy finds out from Ricky that Superman would not be coming to the birthday party. Oops! Well, Lucy get a Superman costume and a helmet to hid her red hair from the kids. The story continues to Saturday, when Lucy goes to the next door apartment, (which is empty and available for rent), and goes outside the window ledge to come through her own living room. Long story short... Lucy ends up outside the living room window, and sees that Superman had arrived after finding out that Ricky had invited him to a child's birthday party. Lucy then attempts to go back to the other apartment's window, along with the dozens of pigeons that had kept her from reaching her apartment's living room window earlier, to find that there was a couple looking at the apartment. She didn't get in, and it started raining. The visiting man shuts and locks the window, and they leave. Meanwhile, Ricky asks where Lucy was? Ethel gasps and says that she was outside on the ledge. Her Superman cape was stuck on the post, and Ricky attempts to move the piano that is in front of the window. He couldn't, and then Superman moves it and walks out on the ledge to save Lucy. Great scene! This was really a 'Superstar Special' in my estimation! The colorization of all the characters, including Superman was spot on! 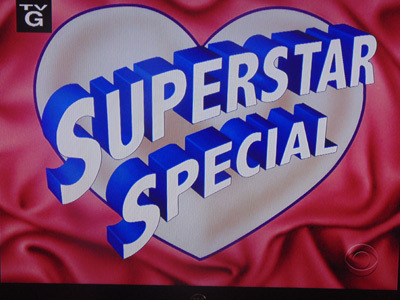 When this Superstar Special is re-run, you have to check it out!